There is no shortage of things to do in Jersey. The island is ideal for adventure and activity holidays, because it is possible to cram a lot of different activities into your stay. Some have even suggested that Jersey is a mini New Zealand, when it comes to an adventure and activity holiday. There are lots of other activities, attractions and facilities on the island so you can have more than just a kayaking or adventure holiday in Jersey. Discover our history in the morning, take a walk, go sea kayaking or sea canoeing (as it is sometimes called) or go surfing in the afternoon. Then enjoy a good meal and chill out in one of the night spots. Here are a few ideas for your activities. 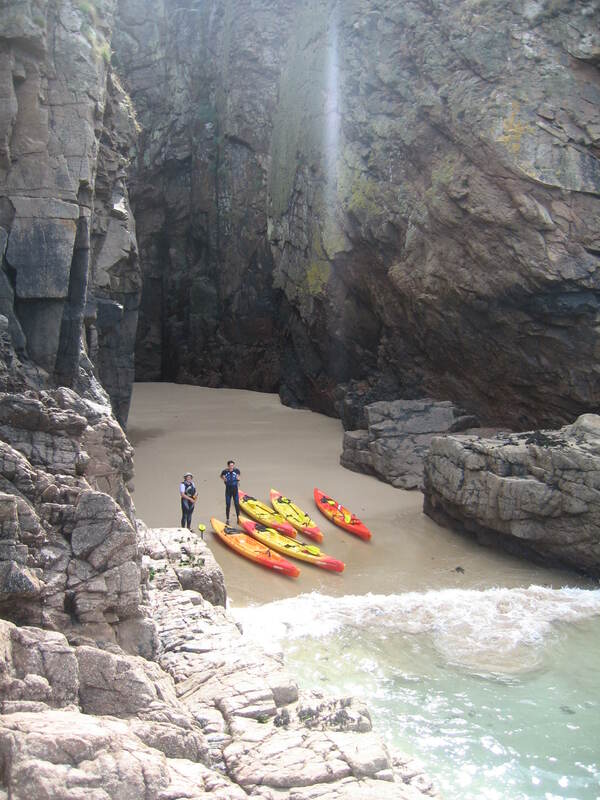 Jersey has superb coastline for both sit on top and sit inside sea kayaking adventures. The island is one of the best sea kayak destinations in the UK so there is plenty of sea kayaking activities around the coast. Observe wildlife, discover hidden caves and beaches, or just chill out. Even if the weather is poor there is usually a suitable location nearby. This is one of the big advantages of sea kayaking in Jersey. Walk on the seabed: With a tidal range of up to 12 m Jersey has some of the highest and lowest tides in the world. Our sister business Jersey Walk Adventures runs guided walks offshore in the Ramsar site on the south-east coast. This is a fantastic opportunity to take a “moonwalk” on the seabed. Swimming – beaches: Jersey beaches are some of the cleanest in the UK. The water quality is high, colours as bright as on some beaches in the Caribbean. St Ouen, Plemont and Greve De Lecq have beach guards in summer. Most other beaches are safe, but you should check the information boards for advice. Green Island is a popular family beach. Beauport leaves you thinking you are in the Mediterranean. Portelet Bay rarely has more than 50 people on it. “Wild swimming” or long distance swimming is very popular in Jersey. The Jersey Long Distance Swimming club are the people to contact. They organise swims all year round and round the island swims. Surfing: It is best at St Ouen’s Bay. Follow the safety signs and beach guard instructions. It is possible to hire boards and get tuition. Surfing is also possible at the East end of St Brelade bay around half tide if St Ouen is blown out. Greve d’Azette can be a good spot aroud high tide if it is big at St Ouen and you do not want to go to St brelade. Remember you need third party accident insurance if you surf in Jersey. There are other good spots but you need more experience. Scuba diving: If you fancy diving, Bouley Bay Dive Centre is a small family run businesses, which offer lots of diving programmes. Explore these quiet, wild places as part of your adventure holiday. Les Minquiers is the more remote and will appeal to the more adventurous traveller. Both reefs have been declared Ramsar Wetland sites in 2005. You find an article on Les Ecrehous in our Media page. We organise walking tours of les Ecrehous. Travel over by charter boat and explore the reefs on foot with a guide. Tours are around 5 hours duration as there is so much to discover. Fishing: Charter boat fishing trips are available. You are almost 100% certain to catch something! Shore fishing is good and it is possible to fish off all the harbours. Unless you have local knowledge fishing off the cliffs is not a good idea, as you can get some large swells. If you are bringing your own kayak, ensure you have checked the tides and weather. We run kayak fishing trips and courses. Cliff jumping: Not for the faint hearted, known as tomb-stoning in Cornwall. This is probably Jersey’s national adventure activity sport. Go round any harbour or bay and you will see people leaping off ledges and walls into the sea. Do not try this, if you are unsure of water depth and do not jump from big heights, if you have little experience. Many of the local teenagers started, when they were 5 and 6 years old. Wear wetsuits. Get local advice. Take care. See this video or this for an awesome jump. Coasteering: Absolute Adventures offer coasteering in Jersey, a wet scramble around the base of cliffs. You need a good head for heights. Expect to get very wet! High Ropes: Valley Activity centre. A Green Tourism Gold Standard centre. Try out your climbing skills on a high ropes course. Walk amongst tree tops or try the exciting para fan and zip slide over the lake. An ideal outdoor activity for families. Walking: A great way to experience Jersey! The OS map 1:25 000 shows lots of routes, but it is worth checking with Visit Jersey for new paths. There are a few walking guide books available (one by Sunflower books). Good leaflets with walks in the 12 parishes and a map are available at Jersey Tourism. The north coast cliff path offers excellent views of the other Channel Islands. The small lanes are often very quiet, some of them called Green Lanes. They restrict vehicle speed to 20 mph. Take, however, care near bends – some motorists still may drive a bit too fast. During the spring and autumn Walking Week Visit Jersey offers a cornucopia of walks all over the island, led by experienced guides as Arthur Lamy. Cycling: The Green Lanes with a vehicle speed of 15 mph are ideal to explore the island off the busy roads. Jersey Tourism publishes good information on cycling routes, which are well signposted around Jersey. Climbing: A number of good tours and a few guidebooks have been published. Strangely, many locals do not think, you can rock climb in Jersey! Dolmens, iron age forts, castles and Nazi bunkers – history buffs won’t have a minute to rest. 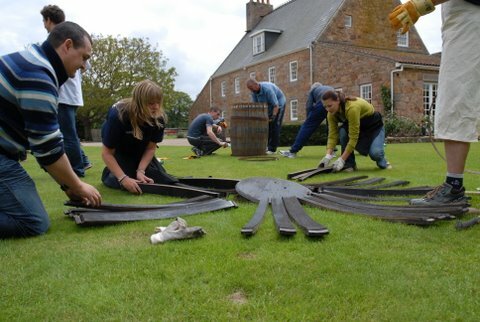 Jersey Museum, the Maritime Museum and Elizabeth Castle in St Helier as well as the Hamptonne Museum of Country Life in the parish of St Lawrence, Mont Orgueil Castle at Gorey and the neolithic site La Hougue Bie are worth a visit as part of your activities. They have won many awards for their exciting and stimulating presentations. Jersey Heritage has exhibitions like the noteworthy “Marilyn” exhibition showing Marilyn Monroe’s fantastic film costumes at the Jersey Museum. They also run other events such as concerts at their sites. It pays to buy a “Heritage card” if you plan to visit a few of these sites. Green Tourism member. Jersey War Tunnels: A good way to learn about the occupation of Jersey by the Nazis and also the tyranny of the Nazi regime. Less of a show of military equipment today. Now it has a strong emphasis on the personal tragedies of war. A thought provoking attraction which has linked the experience of this epoch to the modern day. With an even milder climate than the most southerly parts of Britain Jersey boasts grand gardens – parks with the ambience for stage-plays in summer and cottage gardens where the plant collectors will find paradise. The gardens of Samarès Manor in St Clement have their origins in the 19th century. Nowadays they include a magnificent herb garden, a rose and lavender garden, exotic borders, a shade and water garden, a Japanese garden and a lovely apple barge. Some of the plants are available in the nursery and can be taken to the UK. With the café for a break you might spend there a whole day, enjoy one of the talks or visit the Manor house. Between May and September Judith Querée takes her visitors round her garden in St Ouen. She will show the collection of water plants, explain all about climbing clematis or the charm of primulas. For garden lovers a site not to be missed. Speaking about climate – finding a vineyard in Jersey shouldn’t be a surprise. But a tour at La Mare Vineyard will take you around vineyards and orchards, allow you to look behind the scene of cidre production and into the kitchen where mouth-watering chocolates are created. Green Tourism member. Most adventure and activity providers in Jersey run summer activity courses. Education Sport and Culture publish a guide to summer activities. Many of the above mentioned beach and water activities are a great delight for children. We run family kayaking trips and courses for children and families during the Summer. The cultural attractions also have special programmes or events for children during the summer months. Families for example can take part in nature hunts at Samarès Manor. Durrell Zoo, also known as Jersey Zoo, is unique. Set up by Gerald Durrell this is an amazing zoo, which is full of very rare creatures including Orang-utans and also famous for its work on breeding programmes. Make time for this unforgettable experience with your children.